Before the Civil War, the Bibb County Academy was operated as a public school; a county poor student fund paid the tuition for students unable to pay. In 1870, when Georgia established a true public school system, the Bibb County Board of Education and Orphanage was established to operate a school system for the county. The new board created grammar schools in each ward of the city and "The Central High School." In the 1880s the “Central High School” name was changed to Gresham High. In September, Lanier Senior High School for boys first opened its doors. Lanier High for boys was established on Holt Avenue on the old Willingham Mill site. The Forsyth Street building became Lanier High for girls. A.L. Miller Senior High School for girls was established on Montpelier Avenue. Lanier for girls on Forsyth Street remained on Forsyth Street as the girls’ junior high school. The photograph at right is an old photograph of the Miller High building, though the stately structure remains little changed and still standing -- though little used. With increasing enrollments, Lanier Junior High School for boys was built on Hendley Street near Lanier Senior High, and Miller Junior High School for girls was constructed next to Miller High replaced Lanier for Girls on Forsyth Street, which became the Bibb County Vocational Building. With the opening of Willingham for boys and McEvoy for girls, for the first time Miller and Lanier no longer served all of Bibb County. Elton Wall became the first Lanier graduate to return as its principal. On April 17, 1967, Lanier High School burned to the ground. Several youths were later arrested and convicted of arson. The school was rebuilt. 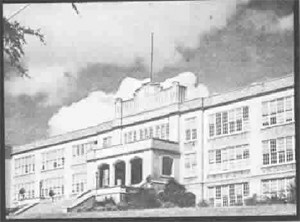 During the rebuilding, the senior high boys reported to school on a split day schedule sharing the old Lanier Junior High with the junior high boys. Lanier High School was renamed Central High Complex. Lanier and Miller built traditions of excellence. The Lanier Poets won numerous state athletic titles, and became a basketball powerhouse. The school's JROTC program received national honors as an exemplary unit. Academically, Lanier and Miller grads went on to top colleges across the country.